Three (3) Braxton Ponder (Alabama, 1915-2001) folk art carvings. 1st item: Painted wood, cloth, nail, and flat push pin carving depicting the Last Supper with Christ and the twelve apostles. Unsigned. 8 1/4" H x 30 3/8" W x 5 1/2" D. 2nd item: Painted wood carving of a pink and white ox. Signed "BP" right haunch, signed and dated "B. Ponder 1990", underside of base. 6 1/2" H x 8 5/8" W x 12 1/4" D. 3rd item: Painted wood, nail, and rope carving of a bison. 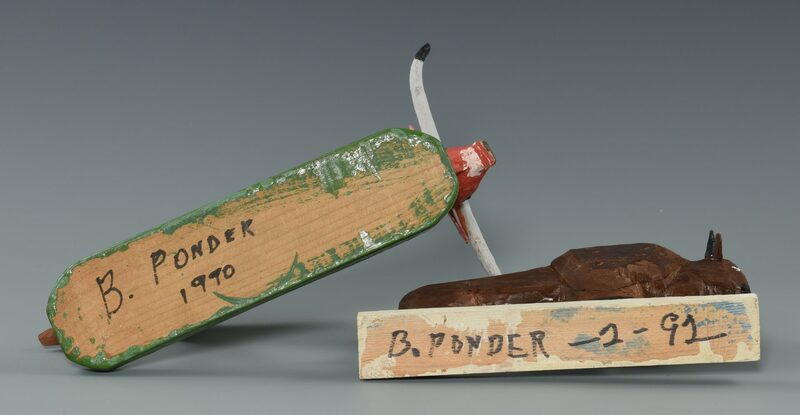 Signed "B. Ponder – 2 – 91", underside of base. 6 1/4" H x 2 3/8" W x 9 1/2" D. All items late 20th century. Provenance: Property of the Arts Center of Cannon County, Tennessee. CONDITION: 1st item: Figure loose from bench, far left. 3/8" area of wear to cloth, far left. Minute paint flakes, scuffs, surface of figures. 2nd item: Break to tip of right horn. Minute scuffs, paint flakes, cracks, surface of ox. 3rd item: Minute scuffs, paint flakes, surface of bison.